I'm going to start my saying I freaking love Malorie Blackman and everything I have read to date of hers I have loved. I was lucky enough to meet her back in September through an event planned by the North Norfolk Children's Book group (which I would totally recommend you join if you live in Norfolk and love children's books). She was as warm and bubbly as I have always expected her to be and speaks faster than I do which is impressive. 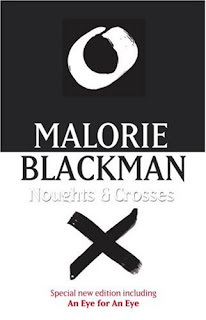 I loved hearing her talk about how she came to being an author and loved the insight I got about her noughts and crosses series by listening to her talk about how much of her inspiration for the novels came from her own personal experiences. I read noughts and crosses well before I started blogging back in the days where I randomly picked up books because the cover looked interesting. What I loved about them was how true to life they actually are in how they portray the racist way in which some people in our society have and continue to operate. I loved the twist in the world view and thought it was a really clever take on the issues it brought up. I loved the main characters and immediately went straight through the series back to back and bought (and continue to buy) several copies for friends who I know love reading all of whom have enjoyed them as much as I hoped they would. I also loved the comparsions and links to historical events linked to the civil rights movement campaign in Amercia and coould certainly see how it could be used as a spectacularly useful teaching tool to help youngesters get insight into rascism, bullying and how such narrow minded views led to awful consequences. Certainly a series that is worth a read and one I cannot recommend highly enough. I have the first one of these books but I have never got around to reading them. I must rectify that. I loved the first book in this series but haven't got around to reading the rest yet. I really must do something about that lol. It's the curse of a mountainous to read pile! I recall just being blown away by it. I still have to read the third though. The ending in the second? WOW! I really loved this series as well! I remember them being really emotional and powerful. Great books.